Here are a few pictures of the modular plug-ins I've created to go along with my modular hulls idea. E.C.M. Pod (1 Blue die) [Suggested by Ced23Ric.] On the right you can see it broken down. Obviously, you do not have to use these stats and can label these creations however you want in your own games. 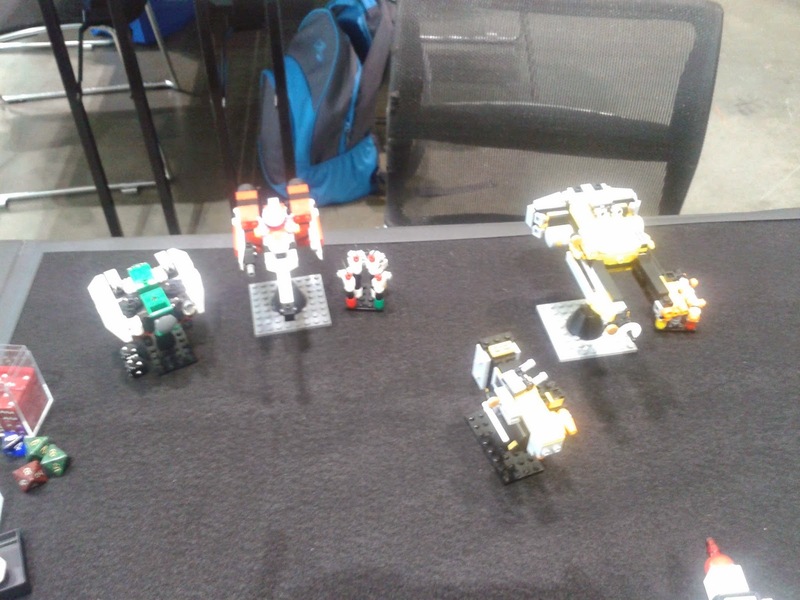 These are the pieces I used for the stand. As you can see it doesn't require much in the way of parts to make a modular plug-in. If you count the friction pins the Mass Driver and the Bridge both have eight pieces. I know some people are already experimenting with this idea, so let's see what you can do! I had an idea the other day as I was driving in to work, modular ships for MFZ: Intercept Orbit. A set of base "hulls" for Frigates and Carriers/Cruisers that allow you to attach modular sections for Attachments and greebling. 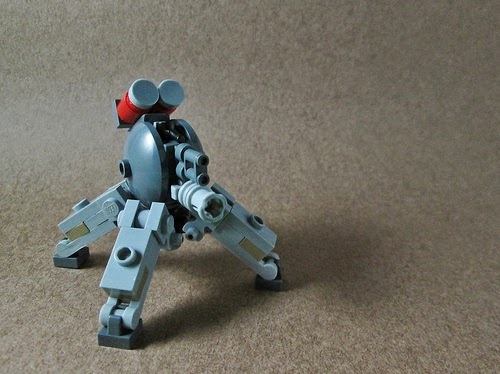 Weapons, sensors, defenses, and catapults will all be detachable and interchangeable. Wings, cockpits, engines, etc. will all be detachable and interchangeable. The core for a Frigate is a stack of paired, alternating (north/south and east/west) 1x2 Technic Bricks. The stack is 9 bricks long to leave room for modules and not break the 12 stud length limit for Frigates. The core for a Cruiser/Carrier is a stack of paired, alternating (north/south and east/west) 1x4 Technic Bricks with regular 1x2 Bricks to fill in the gaps. The stack is 12 bricks long to leave room for modules and not break the 16 stud length limit for Cruisers/Carriers. These may look a little ugly. Okay, they're a lot ugly. 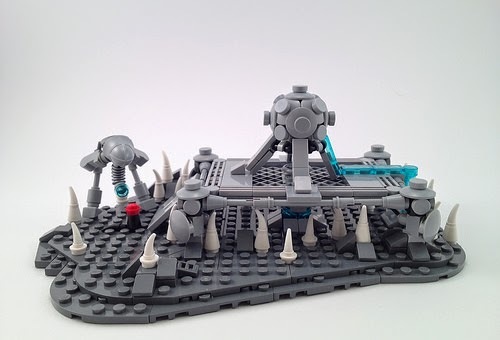 But I'm hoping this design idea will allow new players to quickly build the base hulls to play the game and also allow players to easily remove attachments to reflect battle damage. Here's a look at both hulls with a few Attachments and greebles. The Attachments that I added are Turret (2 Red dice at Assault range), Mass Driver (2 Red dice at Support range), Sensor Pod (1 Yellow die). The greebles that I added are the Bridge and the Engines. I'll show you pictures of the modular plug-ins in my next blog post. Today is the last day -- 13 or so hours left as of this posting -- of the Formerly-Known-As-Alpha-Bandit Kickstarter. So if you want to contribute in some way I suggest you do so. It doesn't have to be one of the backer levels if you're strapped for cash. Even a dollar helps out a little bit now that the project is fully funded. We've already hit one stretch goal, can we hit another? I've made a few tiny tweaks to the review system. The changes consist of notes for people who want to use it to do their own reviews, clarification of my thinking while going through the review process. The IRC chat is seeing some heavy traffic again. 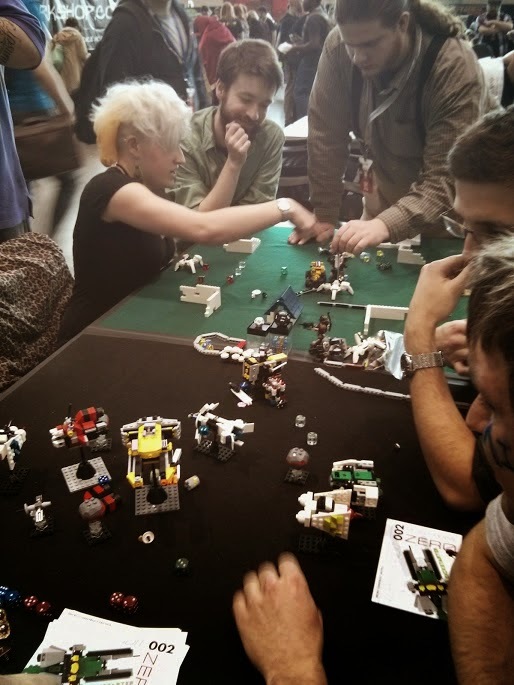 If you're interested in chatting live with other MFZ enthusiasts, give it a try. The first episode of the Transit Gate podcast has dropped. It's a fun listen. This one's a Target exclusive. Regular price is $3.29, it's being clearanced for $1.64. Price per piece at regular price is $0.06. Parts. Those 1x2 - 2x4 Brackets are pretty neat. Other good parts are Cheese Slopes, 1x1 Cones, 1x2 Modified Plate w/2 Horizontal Clips, and the 1x2 Modified Plate w/Bar (Closed Ends). The 2x2 trans-clear Slope Bricks might make good cockpits for mechs, too. 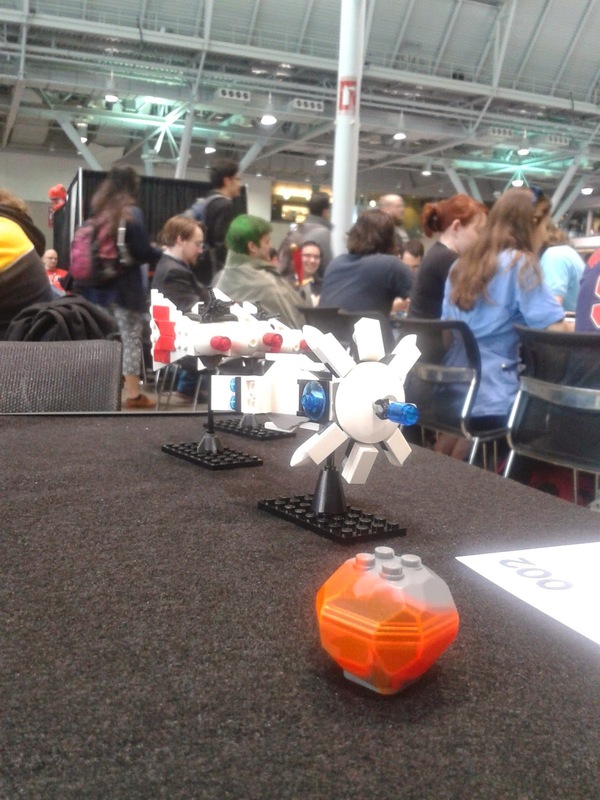 This can be an Alpha Bandit Micro-Frigate, or maybe some sort of flying frame for Rapid Attack. Score: A- (+10). It's a good set, at a good price. It just needs a little more in the way of fiddly bits to get a better score. Here's some pics to look at because it's a holiday for me and I'm feeling lazy. 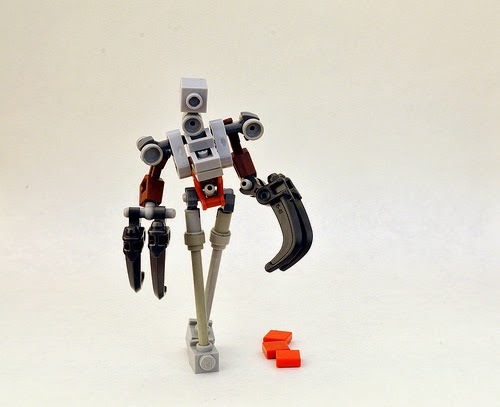 Chasm Heavy by Ironbricks. A fairly simple and clean-lined design. Something Different by A Plastic Infinity. This one is definitely different. I'm not sure it would hold up as a game piece, but it has construction techniques that are intriguing. "Fawn" Seeker Drone by Trash Can Man. I'm not sure I like this one. It is an interesting build though. Untitled by Mechanekton. This one has an interesting connection between Clip Tiles and Grille Plates. 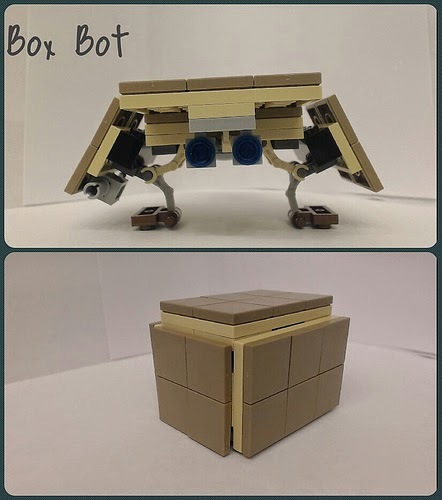 Box Bot by The Beetle125. 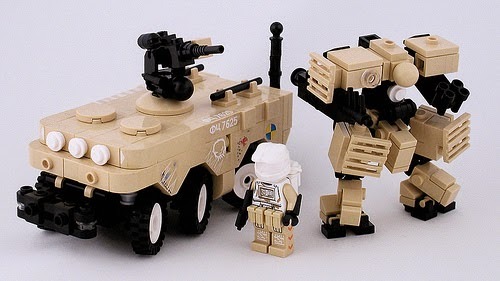 I'm not sure how you'd stat this up for MFZ but, putting a squad of these on the table definitely would be fun. 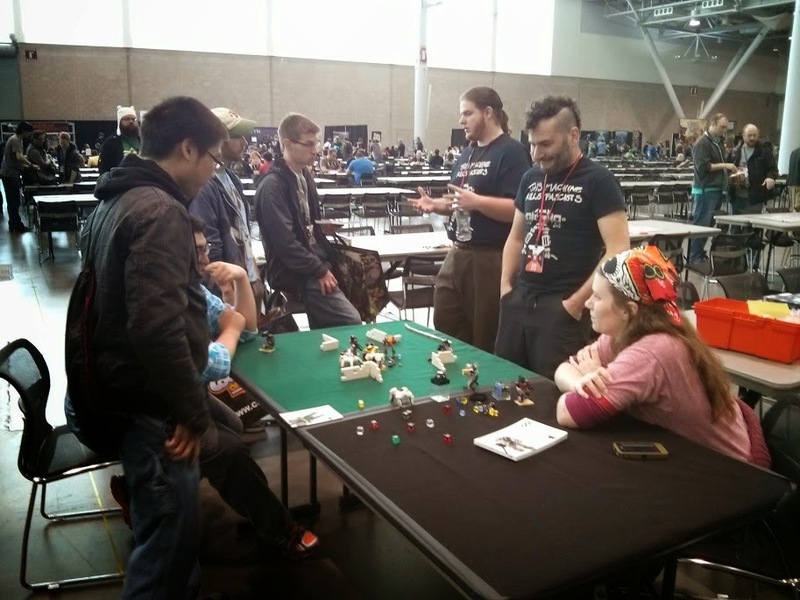 Here are a bunch of pictures from PAX East 2014. Some I took myself, some I tracked down online. Waiting for Alpha Bandit on Day 2. PAX East 2014 First Day Pictures by Flavio Mortarino. 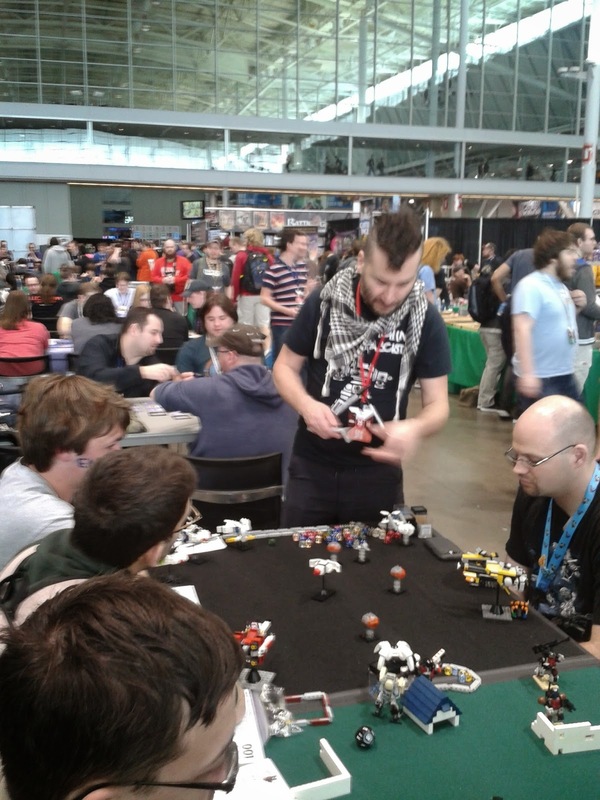 PAX East 2014 Second Day Pictures by Flavio Mortarino. PAX East 2014 Last Day pictures by Flavio Mortarino. And now some pictures from my phone. Setting up for Alpha Bandit. Solar Union and Free Colonies fleets. Joshua, Flakmaniak, Vlad, and Ryan. Day 2 picture from Flickr. Another Day 2 picture from Flickr. 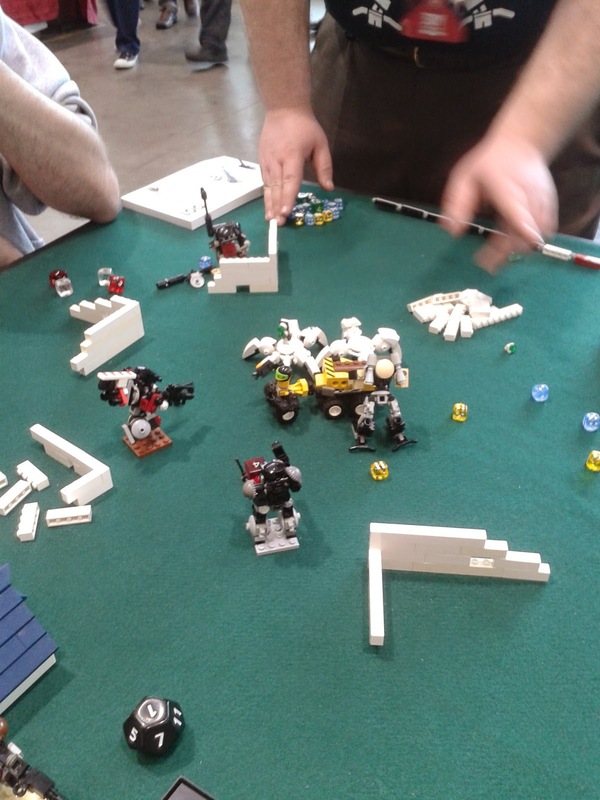 An entirely different game of MFZ that I knew nothing about. 1.) I'm definitely going to bring business cards next year. 2.) Maybe we should have t-shirts for the MFZ demo crew? 3.) I'm going to take time next year to actually look at stuff, not just wander around aimlessly. 4.) I'm going to play some games next year too. 5.) I need to keep track of the condition of my voice next year. Considering how wrecked my voice got this year, I may have to impose periods of no talking on myself next year. 6.) 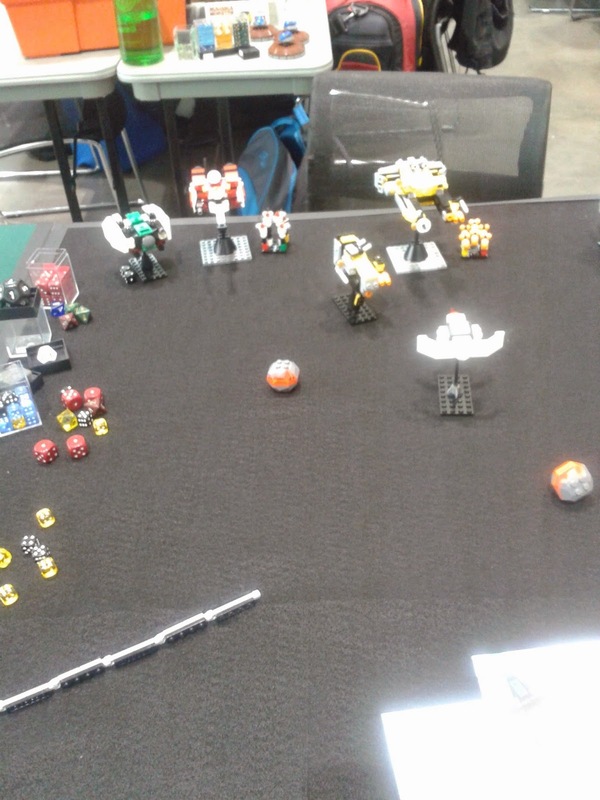 Have a full game of MFZ set up, in addition to the demo games, so we can show what one looks like. 7.) 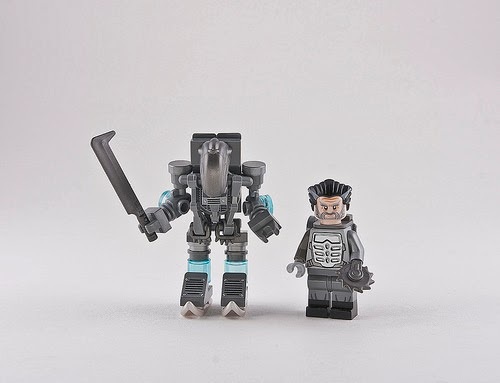 MFZ: Alpha Bandit aces are powerful, scary, and game-changing. 8.) 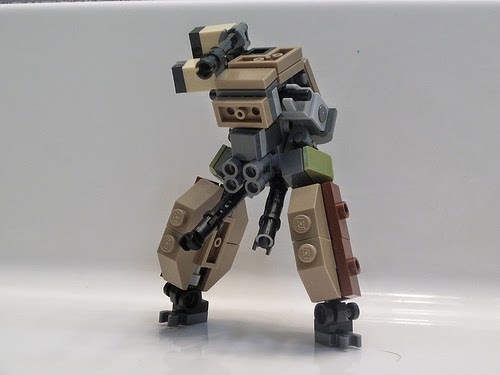 I need to play more games of MFZ:AB so I can explore the tactical space it creates. 9.) 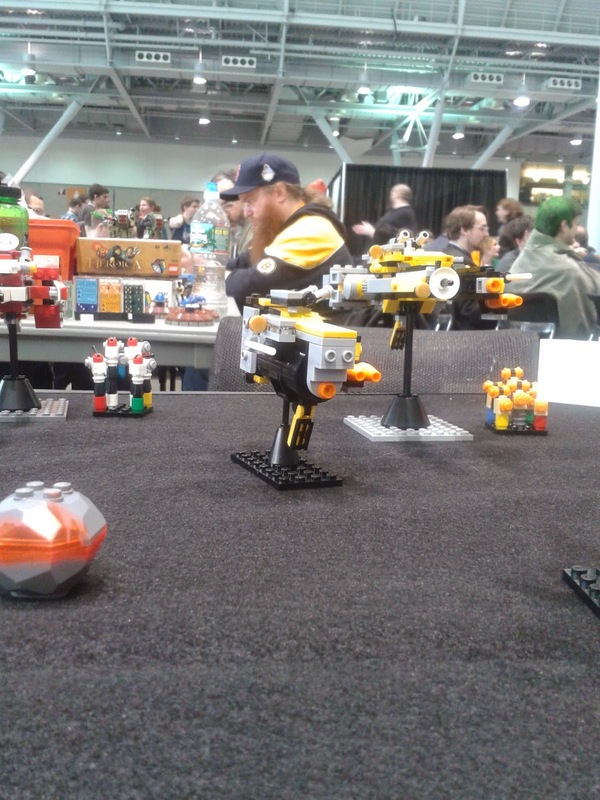 One drawback to attending PAX East is that I want to talk more about PAX East and MFZ on Monday and I have to go back to work. 10.) If I attend for three days again next year, I'm taking Monday off to recover. 11.) I barely cracked my Demo bag open the entire con. 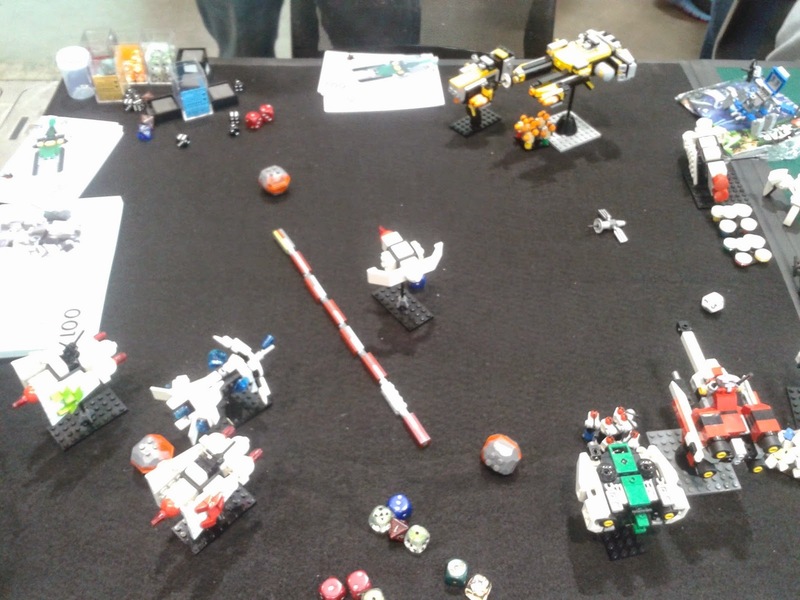 We used Joshua's stuff for the regular MFZ demo and the ships I built for the Alpha Bandit demo along with a couple of other items. 12.) I want to set more definite dinner plans with people next year so we can actually spend time together outside of the con for a little while. 14.) 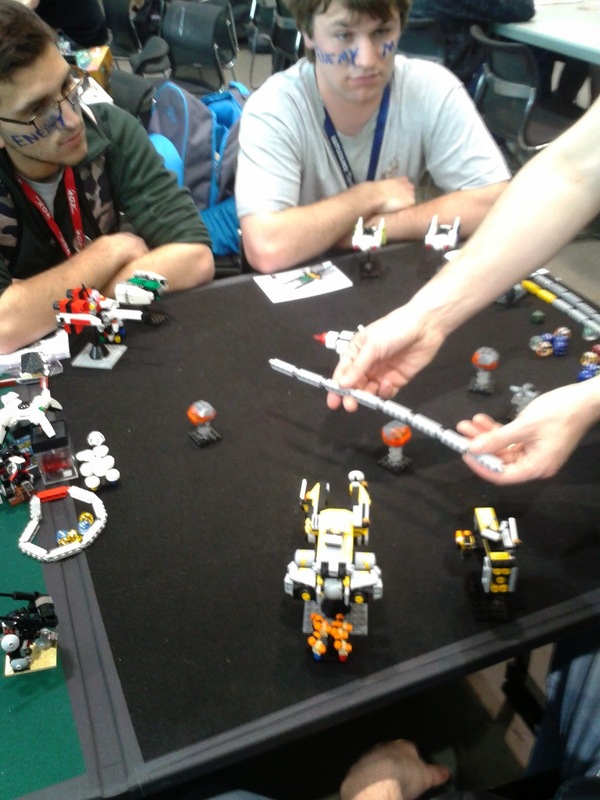 As far as I can tell, anyone who chose the team with the Artillery mech for their demo of MFZ did not win. 15.) 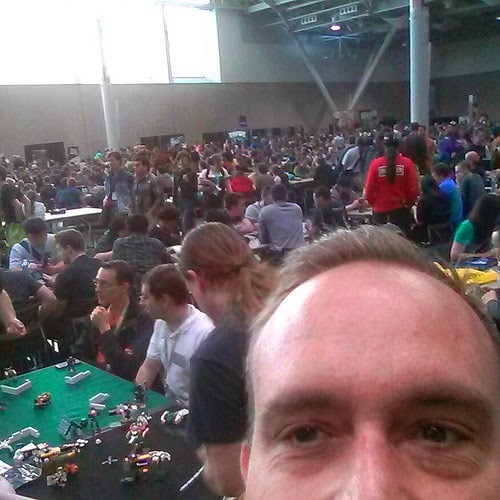 I'm going to get together a crew of my geeky friends to attend next year. 16.) I'm going to make better attempts at showing up on time next year. 11am or later does not really cut it. I'm back from PAX East. Once again I had a wonderful time, and -- again -- I added a day of attendance. I'm trying to type this up on Monday morning and it's all a blur of experiences and events. I'm not going to give a recap by the day as I've done before as it would take too long for me to type out. I guess I'll just give out impressions. There were bag check lines this year. Thank you, Tsarnaev brothers. 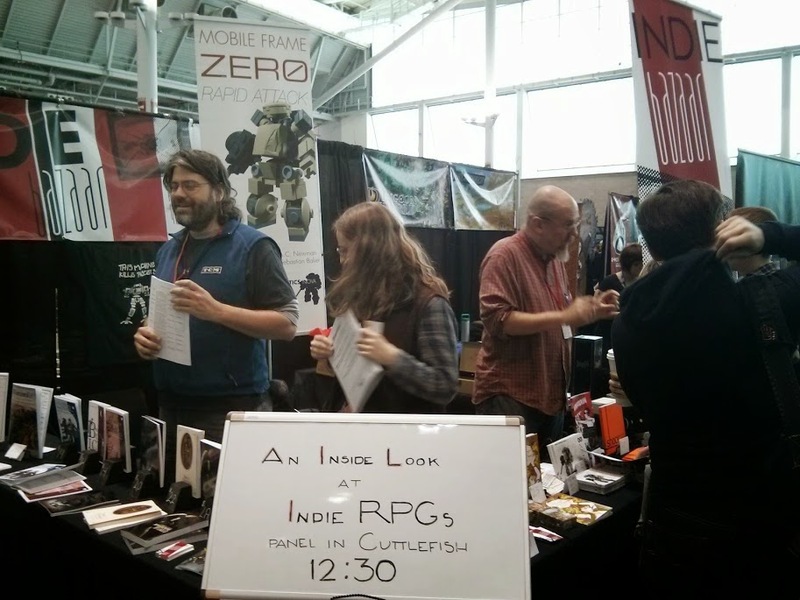 I moderated a panel for Indie gaming on Friday which was a new experience and a fair amount of fun. 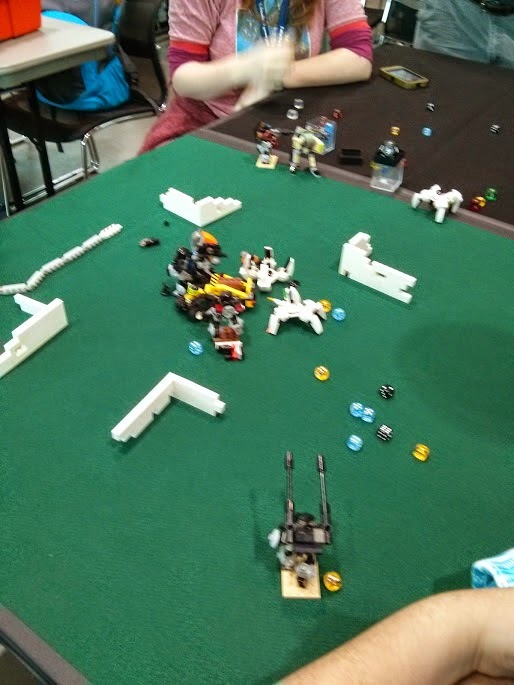 Joshua didn't get the chance to show me Alpha Bandit until Friday evening but it is really neat and an interesting twist on the base rule set. Soren's ship designs are going to blow your mind. 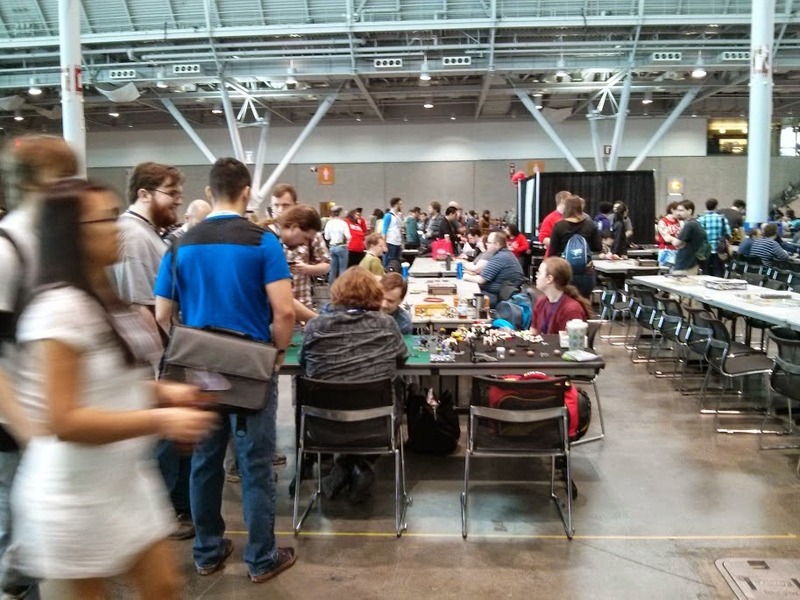 I managed to wander the con on Friday afternoon after doing the panel and running some demos. I saw a lot of interesting things but not a lot of stuff I wanted to buy. 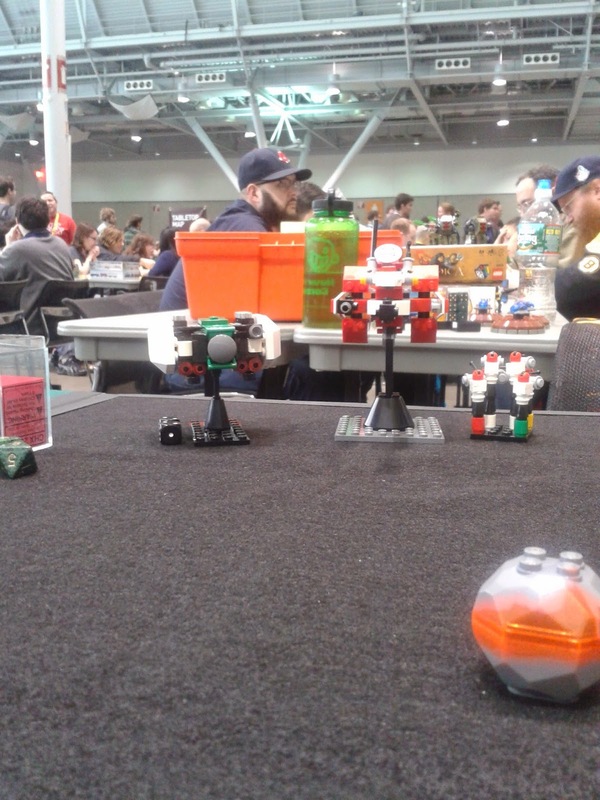 Saturday is just a mental blur of demos and talking to people about MFZ. 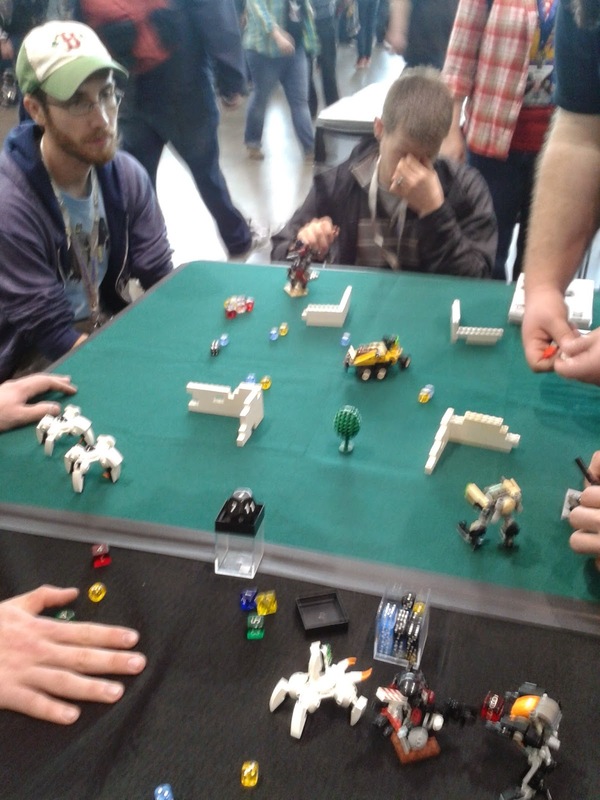 :-) I did get to run my friend Tom through a demo of Alpha Bandit that morning though. Sunday is mostly the same. 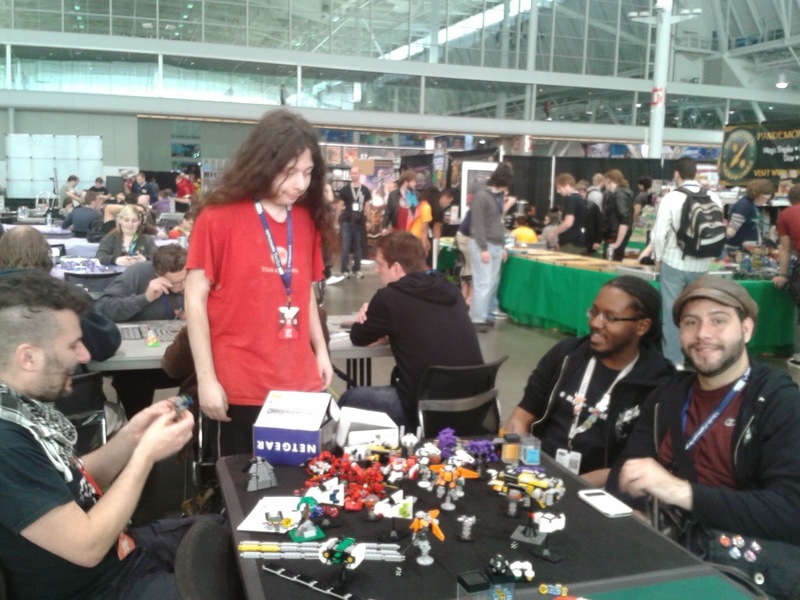 I did get to meet Vlad and Ryan again, whom I met the first time I did PAX East back in 2012. It was great seeing both of them again. Flakmaniak from the Hangar stopped by and showed off a number of his creations at the same time Joshua and I were talking to Vlad and Ryan. 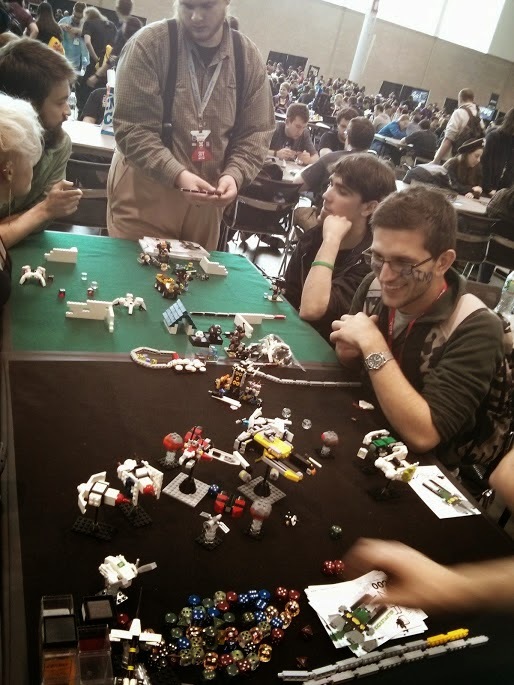 We all had a great time ogling his mecha. I came real close to losing my voice on Sunday. I haven't done any talking yet today so we'll see how it is later. 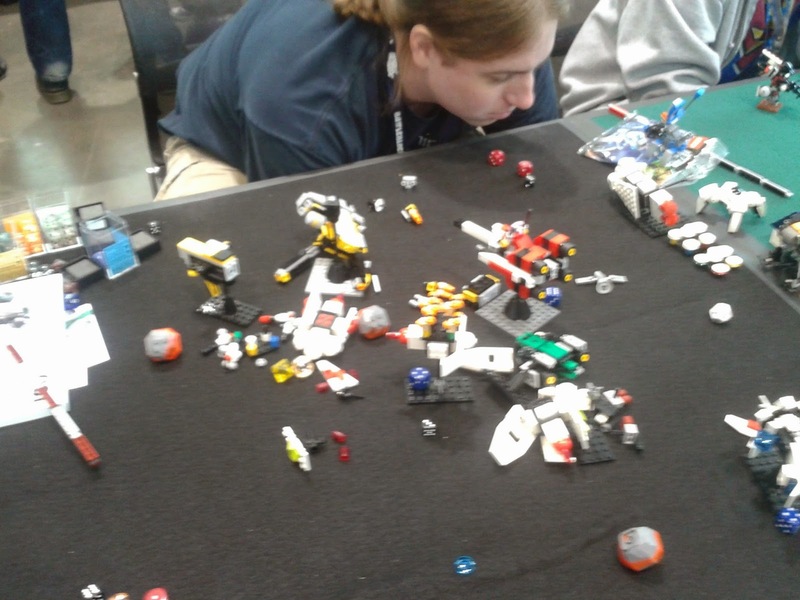 I think the two main things people brought up about the game were, "How do you get the Lego to assemble the models?" and "The game is great but I have no one to play with." If I'm forgetting anyone, I'm sorry. I met and talked to a lot of people over three days. The package. It retails for $3.99 at Target, which gives a price per piece of $0.07. Parts. We've got kind of a smorgsbord here. No more than four of any one part. There's a lot of decent pieces but nothing's really jumping out at me. I tried putting together a frame and wasn't that successful. As you can see, you can build a decent looking small spaceship. Score: +10 (A-). It's a fun kit with decent parts. You could even use it for it's intended purpose if you wanted. Target is running a 20% off Creator, City, Disney Princess, and Duplo sale this week. That means that a majority of the sets I listed here will be at really good prices. Also, 71003 Equila's Ultra Striker is 50% off. I really should have done this earlier but I've been distracted by preparing for PAX East. I didn't realize how good the sale really was until I visited my local Target last night. Parts. Yeah, there's not much to look at here. Here's the frame I tried to build. Not all that great. On the other hand, the small frigate I made for Alpha Bandit is pretty good. Score: -5 (B-). Not surprising. It's a tiny set with not much to work with. Once again I'll be helping Vincent, Joshua, and the others demo Mobile Frame Zero. I'm definitely going to be there Friday (4/11), and Saturday (4/12). I should be there Sunday (4/13) too, unless something comes up. I'll have my gear for all three days, and I will have a fleet for Alpha Bandit so we can give that a try. Here's a discussion thread over on the Hangar if you're interested on meeting up. It's been a month since I've done one of these and I want to finish strong for the week. So, here you go. Bug Hunter by Hammerstein NWC. Interesting decal use on this one. I wonder what the third party parts are. You can ignore the minifig. Carnage by 1000 Nuglets. 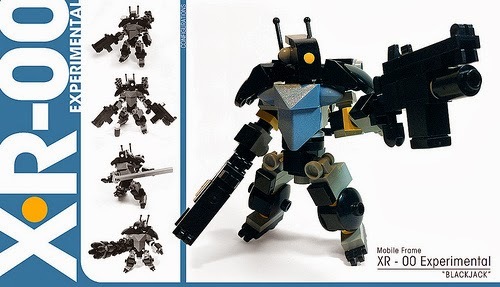 A little tall for MFZ, it exudes style though. Reaper by Nate_Daly. This is the inspiration for the previous selection. XR00 by 256imageworks. It's a Chub variant. Still, looks nice. Major Max Solarflare and "Machete" by Hammerstein NWC. 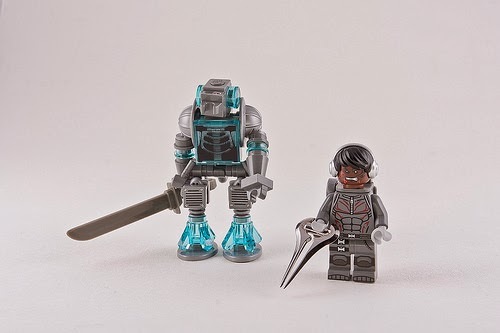 Once again, ignore the minifig.